Parts of this article (those related to date) are outdated. Please update this article to reflect recent events or newly available information. The city of Ithaca /ˈɪθəkə/ is in central New York and is the county seat of Tompkins County, as well as the largest community in the Ithaca-Tompkins County metropolitan area. This contains the municipalities of the Town of Ithaca, the village of Cayuga Heights, and other towns and villages in Tompkins County. The city of Ithaca is located on the southern shore of Cayuga Lake, in Central New York. It is named for the Greek island of Ithaca. Ithaca is home to Cornell University, an Ivy League school of over 20,000 students, most of whom study at its local campus. Ithaca College is located just south of the city in the Town of Ithaca, adding to the area's "college town" atmosphere. Nearby is Tompkins Cortland Community College (TC3). These three colleges bring tens of thousands of students who increase Ithaca's seasonal population during the school year. Some students settle in the area after graduation. The city's voters are notably more liberal than those in the remainder of Tompkins County or in upstate New York, generally voting for Democratic Party candidates. In 2010, the city's population was 30,014, and the metropolitan area had a population of 101,564. Some students have become more politically active in the city. In 2004, Gayraud Townsend, a 20-year-old senior in Cornell's School of Industrial and Labor Relations, was sworn in as alderman of the city council, the first black male to be elected to the council and the youngest African American to be elected to office in the United States. He served his full term and has mentored other student politicians. In 2011 Cornell Class of 2009 graduate Svante Myrick was elected as the youngest mayor of the city of Ithaca. Indigenous people occupied this area for thousands of years. At the time of European contact, this area was controlled by the Cayuga Indians, one of the powerful Five Nations of the Haudenosaunee or Iroquois League. Jesuit missionaries from New France (Quebec) are said to have had a mission to the Cayuga as early as 1657. Saponi and Tutelo Indians, Algonquian-speaking tribes, later occupied lands at the south end of Cayuga Lake. Dependent tributaries of the Cayuga, they had been permitted to settle on the tribe's hunting lands at the south end of Cayuga Lake, as well as in Pony (originally Sapony) Hollow of what is known as present-day Newfield, New York. Remnants of these tribes had been forced from North Carolina by tribal conflicts and European colonial encroachment. Similarly, the Tuscarora people, an Iroquoian-speaking tribe from the Carolinas, migrated after defeat in the Yamasee War; they settled with the Oneida people and became the sixth nation of the Haudenosaunee, with chiefs stating the migration was complete in 1722. Within the current boundaries of the City of Ithaca, Native Americans maintained only a temporary hunting camp at the base of Cascadilla Gorge. In 1788 eleven men from Kingston, New York came to the area with two Delaware people (Lenape) guides, to explore what they considered wilderness. The following year Jacob Yaple, Isaac Dumond, and Peter Hinepaw returned with their families and constructed log cabins. That same year Abraham Bloodgood of Albany obtained a patent from the state for 1400 acres, which included all of the present downtown west of Tioga Street. In 1790, the federal government and state began an official program to grant land in the area, known as the Central New York Military Tract, as payment for service to the American soldiers of the Revolutionary War, as the government was cash poor. Most local land titles trace back to these Revolutionary war grants. As part of this process, the Central New York Military Tract, which included northern Tompkins County, was surveyed by Simeon DeWitt, Bloodgood's son-in-law. DeWitt was also the nephew of Governor George Clinton. The Commissioners of Lands of New York State (chairman Gov. George Clinton) met in 1790. The Military Tract township in which proto-Ithaca was located was named the Town of Ulysses. A few years later DeWitt moved to Ithaca, then called variously "The Flats," "The City," or "Sodom"; he renamed it for the Greek island home of Ulysses in the spirit of the multitude of settlement names in the region derived from classical literature, such as Aurelius, Ovid, and especially of Ulysses, New York, the town that contained Ithaca at the time. Around 1791 DeWitt surveyed was is now the present downtown area into lots and sold them at modest prices. That same year John Yaple built a grist mill on Cascadilla Creek. The first frame house was erected in 1800 by Abram Markle. In 1804 the village had a postmaster, and in 1805 a tavern. With the depression of 1837, the railroad was re-organized as the Cayuga & Susquehanna. It was re-engineered with switchbacks in the late 1840s; much of this route in the late 20th century was converted to trails under the Rails to Trails program; it is used by the South Hill Recreation Way. In 1885, Ithaca Children's Home was established on West State Street. The orphanage had two programs at the time: a residential home for both orphaned and destitute children, and a day nursery. The village established its first trolley in 1887. Ithaca developed as a small manufacturing and retail center and was incorporated as a city in 1888. The largest industrial company in the area was Morse Chain, elements of which were absorbed into Emerson Power Transmission on South Hill and Borg Warner Automotive in Lansing, New York. Ithaca claims creation of the first ice cream sundae in 1891 by local fountain shop owner Chester Platt and Unitarian reverend John Scott on April 3, 1892, but this has been debated. The local Unitarian church, where Rev. Scott preached, has an annual "Sundae Sunday" every September in commemoration. After World War II, the Langmuir Research Labs of General Electric developed as a major employer; the defense industry continued to expand. GE's headquarters were based in Schenectady, New York, to the east in the Mohawk Valley. For decades, the Ithaca Gun Company tested their shotguns behind the plant on Lake Street; the shot fell into Fall Creek (a tributary of Cayuga Lake) at the base of Ithaca Falls. Lead contaminated the water supply, air and land. A major lead clean-up effort sponsored by the United States Superfund took place from 2002 to 2004, managed through the Environmental Protection Agency. The old Ithaca Gun building has been dismantled. It is scheduled to be replaced by development of an apartment complex on the cleaned land. Due to the microclimates created by the impact of the lakes, the region surrounding Ithaca (Finger Lakes American Viticultural Area) experiences a short but adequate growing season for winemaking similar to the Rhine Valley wine district of Germany. As such the region is home to many wineries. Ithaca is a major educational center in Central New York. In 2011 there were about 21,000 students enrolled at Cornell and about 6,400 at Ithaca College. Tompkins Cortland Community College is located in the neighboring Town of Dryden, and has an extension center in downtown Ithaca. Empire State College offers non-traditional college courses to adults in downtown Ithaca. The public school system is based in Ithaca. The Ithaca City School District, which encompasses Ithaca and the surrounding area, enrolls about 5,500 K-12 students in eight elementary schools, two middle schools, Ithaca High School, and the Lehman Alternative Community School. Several private elementary and secondary schools are located in the Ithaca area, including the Roman Catholic Immaculate Conception School, the Cascadilla School, the New Roots Charter School, the Elizabeth Ann Clune Montessori School, and the Ithaca Waldorf School. Ithaca has two networks for supporting its home-schooling families: Loving Education At Home (LEAH) and the Northern Light Learning Center (NLLC). The economy of Ithaca is based on education and manufacturing, with high tech and tourism in strong supporting roles. As of 2006, Ithaca has continued to have one of the few expanding economies in New York State outside New York City. It draws commuters for work from the neighboring rural counties of Cortland, Tioga, and Schuyler, as well as from the more urbanized Chemung County. Ithaca has many of the businesses characteristic of small American university towns: bookstores, art house cinemas, craft stores, and vegetarian-friendly restaurants. The collective Moosewood Restaurant, founded in 1973, published a number of vegetarian cookbooks. Bon Appetit magazine ranked it among the thirteen most influential restaurants of the 20th century. Ithaca has many local restaurants and chains both in the city and town with a range of ethnic foods. It has become a destination and residence for retirees, and Cornell has programs to appeal to them. Founded in 1983, the Sciencenter, is a non-profit hands-on science museum, accredited by the American Alliance of Museums (AAM) and is a member of the Association of Science-Technology Centers (ASTC) and Association of Children’s Museums (ACM). The Cayuga Nature Center occupies the site of the 1914 Cayuga Preventorium, a facility for children with tuberculosis; treatment of what was then considered an incurable disease was based on rest and good nutrition. In 1981, the Cayuga Nature Center was incorporated as an independent, private, non-profit educational organization, offering environmental education to local school districts. The Center for the Arts at Ithaca, Inc., operates the "Hangar Theatre". Opened in 1975 in a renovated municipal airport hangar, the "Hangar Theatre" brings a range of theatre to students across New York State. It produces a School Tour and Artists-in-the-Schools programs. Ithaca is also the home to Kitchen Theatre Company, a non-profit professional theatre company located in the West End of the downtown. Ithaca is noted for its annual community celebration, The Ithaca Festival. The Constance Saltonstall Foundation for the Arts provides grants and Summer Fellowships at the Saltonstall Arts Colony for New York State artists and writers. Ithaca also hosts what is described as the third-largest used-book sale in the United States. The School of Music at Ithaca College was originally founded in 1892 by William Egbert as a music conservatory. Among the degree programs offered are those in Performance, Theory, and Composition. Since 1941, the School of Music has been accredited by the National Association of Schools of Music. Several notable musicians call Ithaca home, most notably Samite of Uganda, The Burns Sisters, John Brown's Body, Kevin Kinsella, and X Ambassadors. Traditional folk music is a staple and is featured weekly on North America's longest-running live folk concert broadcast WVBR 93.5 FM's Bound for Glory. The Finger Lakes Grassroots Festival of Music and Dance is held annually during the third week in July, in the nearby village of Trumansburg. The Ithaca Journal, founded 1815, is a morning daily newspaper owned by Gannett. The alternative weekly newspaper, Ithaca Times, is distributed free of charge. 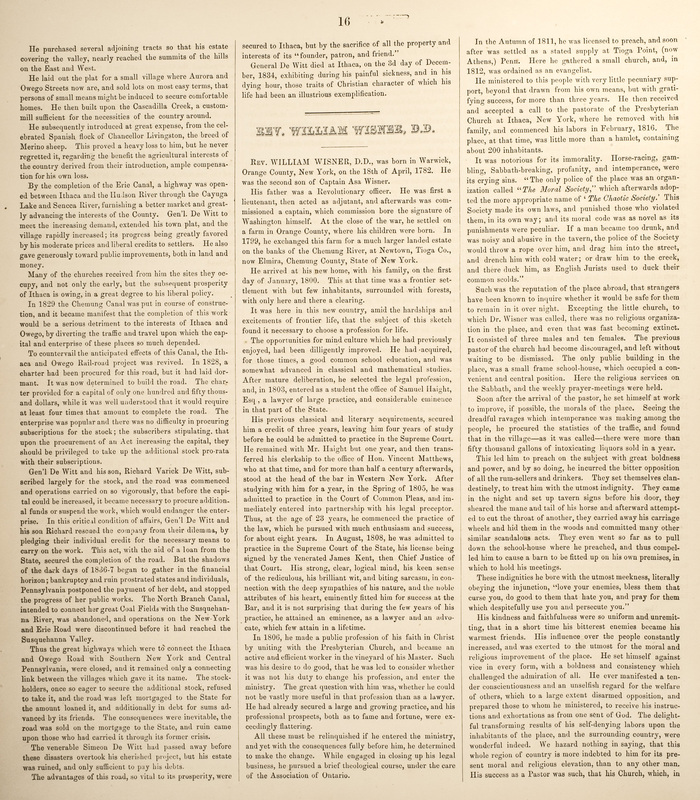 Other area publications include Tompkins Weekly, the Ithaca Community News, 14850 Magazine, the Cornell Daily Sun, the Ithacan, and the Tattler, one of the oldest student newspapers in the United States. Ithaca is home to several radio stations. The Cayuga Radio Group, a subsidiary of Saga Communications, Inc., owns country WQNY "Q-Country" 103.7 FM. WVBR-FM 93.5 FM/105.5 FM, is a student-owned and student-run station with ties to Cornell University. classic rock "I-100" WIII 99.9 FM. Saga also has lower-powered "translator" stations "Hits 103.3" and "98.7 The Vine" on the FM dial. WFIZ "Z95.5" is also in the area, broadcasting a top-40, CHR format. Classic rock "The Wall" WLLW 99.3 and 96.3, based in Seneca Falls, has a transmitter in Ithaca. NPR and classical programming is available on WSQG 90.9 FM, NPR/college programming on WEOS 'repeater' 88.1 FM, and Christian music on 88.9 FM. Since students won the right to vote where they attend colleges, some have become more active in local politics. In 2004, Gayraud Townsend, a 20-year-old senior in Cornell's School of Industrial and Labor Relations, was sworn in as alderman of the city council, representing the 4th Ward. He is the first black male to be elected to the council and was then the youngest African American to be elected to office in the United States. He served his full term and has mentored other young student politicians. In 2011 Cornell undergraduate Svante Myrick was elected as the youngest mayor of the city of Ithaca. Politically, the majority of city's voters (many of them students) have supported liberalism and the Democratic Party. A November 2004 study by ePodunk lists it as New York's most liberal city. This contrasts with the more conservative leanings of the generally rural Upstate New York region; the city's voters are also more liberal than those in the rest of Tompkins County. In 2008, Barack Obama, running against New York State's US Senator Hillary Clinton, won Tompkins County in the Democratic Presidential Primary, the only county that he won in New York State, likely due to support from younger voters. Obama won Tompkins County (including Ithaca) by a wide margin of 41% over his opponent John McCain in the November 2008 election. Ithaca is in the rural Finger Lakes region about 225 miles (362 km) northwest of New York City; the nearest larger cities, Binghamton and Syracuse, are an hour's drive away by car, Rochester and Scranton are two hours, Buffalo and Albany are three. New York City, Philadelphia, and Ottawa are about four hours away. Cleveland, Boston, Washington DC, and Montreal are about five hours away. There is frequent intercity bus service by Greyhound Lines, New York Trailways, and Shortline (Coach USA), particularly to Binghamton and New York City, with limited service to Rochester, Buffalo and Syracuse, and (via connections in Binghamton) to Utica and Albany. The bus station serving all these companies is the former Delaware, Lackawanna & Western railway station on Meadow St. between W State and W Seneca streets, a little over half a mile west of downtown Ithaca. Cornell University runs a premium Campus to Campus bus between its Ithaca campus and its medical school in New York City which is open to the public. Ithaca is the center of an extensive bus public transportation network. TCAT, Inc (Tompkins Consolidated Area Transit, Inc.) is a not-for-profit corporation that provides public transportation for Tompkins County New York. TCAT was reorganized as a non-profit corporation in 2004 and is primarily supported locally by Cornell University, the City of Ithaca and Tompkins County. TCAT's ridership increased from 2.7 million in 2004 to 4.4 million in 2013. http://www.tcatbus.com/files/all/tcat_2013_yearbook_-_final.pdf TCAT operates 33 routes, many running seven days a week. It has frequent service to downtown, Cornell, Ithaca College, and the Shops at Ithaca Mall in the neighboring Town of Lansing, but less frequent service to many residential and rural areas, including Trumansburg and Newfield. Chemung County Transit (C-TRAN) runs weekday commuter service from Chemung County to Ithaca. Cortland Transit runs commuter service to Cornell University. Tioga County Public Transit operates three routes to Ithaca and Cornell, but will cease operating on November 30, 2014. In July 2008, a non-profit called Ithaca Carshare began a carsharing service in Ithaca. Ithaca Carshare has a fleet of vehicles shared by over 1500 members as of July 2015 and has become a popular service among both city residents and the college communities. Vehicles are located throughout Ithaca downtown and the two major institutions. With Ithaca Carshare as the first locally run carsharing organization in New York State, others have since launched in Buffalo, Albany, NY, and Syracuse. Independent studies have shown that for each Ithaca Carshare vehicle in the fleet, 15 fewer personally owner cars are owned. Ithaca is served by Ithaca Tompkins Regional Airport, located about three miles to the northeast of the city center. American Airlines offers flights to its hub at Philadelphia, operated by Piedmont Airlines using de Havilland Canada Dash 8 turboprop airliners. Delta Connection provides service to its hub at Detroit Metro airport, operated by Endeavor Air using Bombardier CRJ-200 airliners. United Express offers three daily flights to Newark Liberty International Airport, operated by CommutAir using Bombardier Dash 8 turboprops. Some residents choose to travel to Syracuse Hancock International Airport, Greater Binghamton Airport, Elmira-Corning Regional Airport or Greater Rochester International Airport for more airline service options. ↑ "EPA Finishes $4.8 Million Cleanup at Ithaca Gun", United States Environmental Protection Agency, October 29, 2004. Retrieved March 25, 2006. ↑ Heffner, Mary C., "History of the South Hill Business Campus"
↑ See, e.g., 1811 article in local paper, at  or Town of Ithaca History project, available online (click on "History Project", then "Historical maps..." and finally "famous for its notorious immorality").